If you want to remove the bumps and top layer of sod from a field that you own, or if you are involved in taking care of a little league baseball field, you will need a field drag to get the job done. Field drags attach to a vehicle and are dragged around a field to remove any bumps in the surface. There are commercially available field drags; however, you can make simple field drags from a variety of materials commonly found in salvage yards or even in your own backyard. One of the best field drag materials available is the metal grating often used at construction sites or on some bridges for scaffolding. Use a cutting torch to cut a rectangular piece of grating to a size of 4 feet by 6 feet, and then attach a chain to one of the 6-foot sides. Strap several 8-inch cinder blocks on top of the grating and secure them in place with wire. 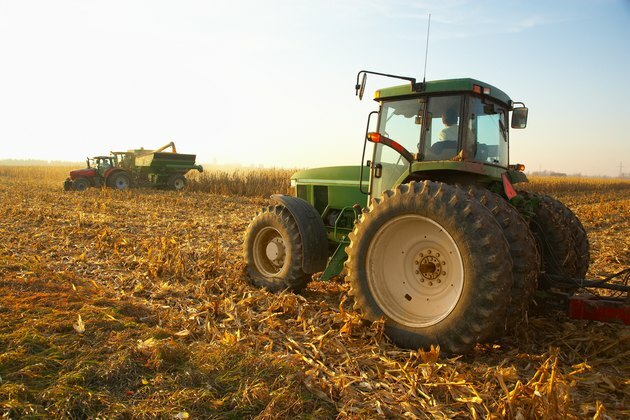 Attach the chain to the bumper of your vehicle and pull it slowly through the field you are working on. Another great material to use as a field drag is chain link fencing. Chain link fence is used in a variety of applications and can often be obtained for free or at a very cheap price from any number of sources. The chain link will be fairly light, thus it is a good idea to purchase a fairly large roll of the material and fold it in on itself several times. Cement blocks or lead weights can then be attached to the top of the fencing, and a chain can be attached to one side. The chain then connects to the vehicle, and can be dragged around the field. You can fashion your own field drag out of scrap metal I-beam pieces. Use a cutting torch to cut two 6-foot sections of metal and two more 4-foot sections of metal. Connect the 6-foot sections of metal together by welding the 4-foot sections to each end and then install a few short pieces of metal to the bottom of all four sides with bolts, or by welding them in place. This type of drag is good for removing the top soil in a field because it digs in more than the other types of drags. Lay a few cement blocks on top of the frame you just built from I-beams, and use metal strapping to attach them to the frame. Attach a chain to the center of one of the 6-foot sides of the frames by drilling a hole into the edge of the frame and securing a link of chain to it with a bolt. Attach the chain to the hitch on the rear of your vehicle and drag the field. Nathaniel Miller is a technical writer for an environmental division of Microbac Laboratories, Inc. He has a Master of Science from Ohio University. With over eight years of technical writing experience, Miller has a diverse skill-set and enjoys a wide-ranging client base. He is widely published on numerous writing websites and runs a small writing business out of his home in Marietta, Ohio.